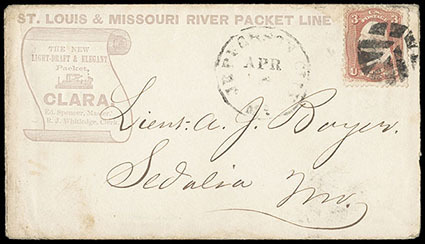 Packet Clara, violet illustrated corner card on cover bearing 3¢ rose (65) tied by segmented leaf fancy cancel duplexed with "Jefferson City Mo. Apr" cds to Lt. A.J. Bayer at Sedalia Mo. ; some edge wear, F.-V.F. and rare, This is the illustrated example in Milgram. Milgram No. 259 Estimate $300 - 400. This Steamboat "Clara" was built in 1864 and operated on the Missouri River until 1870. 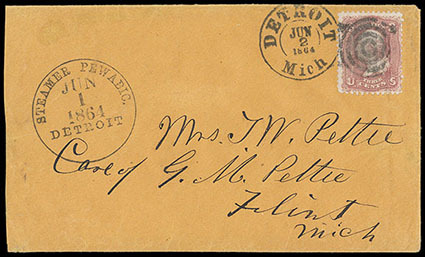 Steamer Pewabic, Detroit, Jun 1, 1864, sharp full strike of cds on fresh cover to Flint, Mich, franked with 1861, 3¢ rose tied by bold "Detroit, Mich, Jun 2, 1864" cds and target duplex; slight reduction, an Extremely Fine strike, the listing illustration in Milgram. Scott No. 65. Milgram No. 1092 Estimate $250 - 350. 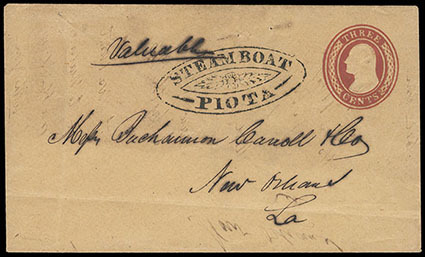 Steamboat Piota, well struck oval handstamp in black on 1853, 3¢ Nesbitt entire to to Buchannon, Carroll & Co. in New Orleans, La., Very Fine and choice strike. Milgram No. 1111 Estimate $400 - 600. Steamer R.W. 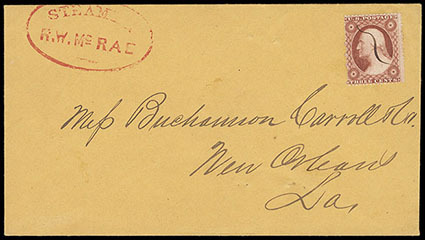 McRae, red oval handstamp on fresh cover to New Orleans, La., franked with manuscript canceled 1857, 3¢ brownish carmine, Very Fine; with 2014 P.F. certificate. Scott No. 26. Milgram No. 1230 Estimate $200 - 300. Steamboat, 5 covers with various markings; two similar serifed straight lines one with Cleveland, O. cds tying #26, san-serifed straight line with Detroit cds cds tying #26, Detroit cds on 3¢ Nesbitt with fancy scroll Steamboat, and 1840 stampless with blue fancy handstamp from Detroit, Very Fine. S.S. "China" * P.M.S.S. Co., S.H. 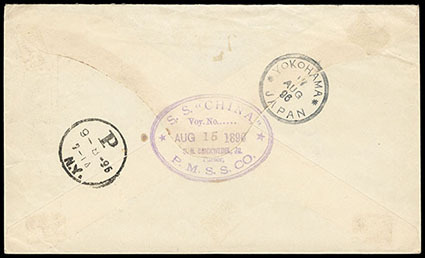 Brickweder, Jr. Purser, Aug 15, 1896, purple double-oval backstamp on cover bearing Japan 5s blue tied by red Japanese cds on cover to E.R. 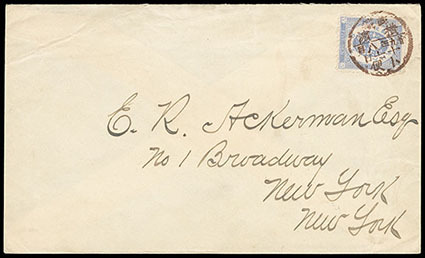 Ackerman, New York N.Y., reverse with Yokohama (8.17) cds and New York (9.8) arrival cds, Very Fine and scarce. Pacific Mail S.S. Co. S.S. 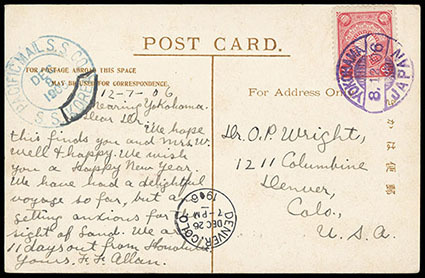 Marking Group, 1906-12, on three postcards; includes 1906 "Pacific Mail S.S. Co. S.S. Korea" cds from Japan to Denver Col., 1908 "Pacific Mail Steamship Co., S.S. Mongolia", two-line handstamp from Japan to San Francisco Cal., and 1913 "Pacific Mail S.S. Co., Yokohama" purple cds from San Francisco, Cal. to Yokohama, Japan, Very Fine. Pacific Mail S.S. 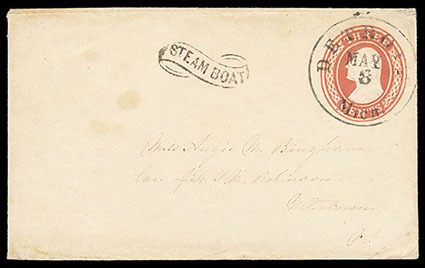 Covers, 1858-67, three manuscript endorsed covers; 1867 "pr Sacramento via Panama" endorsement on uprated entire from San Francisco Cal. 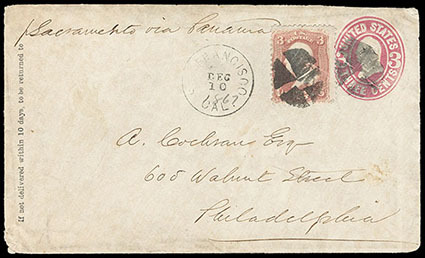 to Philadelphia Pa., 1858 "Sonora" endorsement on cover bearing 10¢ green, type III (33) from San Francisco Cal. to Boston Mass., and "per 'Uncle Sam' Sept 21/60" on embossed corner card cover bearing 10¢ green (35) from San Francisco Cal. to New York City, F.-V.F.